If you are looking to extend the summer season and use the type of pool you have longer, we have the solution. 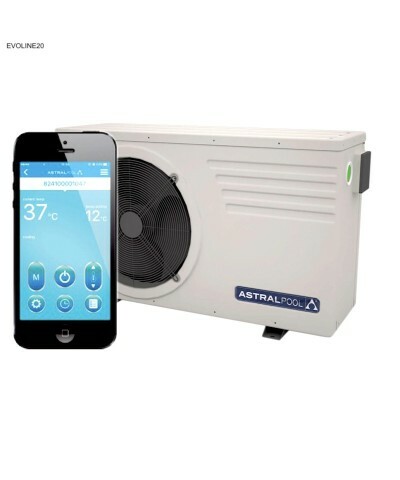 The water & air HEAT PUMP to heat swimming pools with WIFI connection. Evidently, using your pool only a few months (3 - 4) a year is really a waste of money and displeasure, as it costs you equally when unused. Astralpool has created this technology that allows you to extend the summer season to enjoy the pool more months of the year. Product gender: Water and air heater for swimming pools. Pool volume (m³) approx. min/max: 27 - 45. Min water flow (M³/h): 4,9. €2,411.74 Vat incl. €2,411.74 Vat excl. By buying this product you can collect up to 241 loyalty points. Your cart will total 241 points that can be converted into a voucher of 48.2. EVOline is the HEAT PUMP of water & air to heat the pool in the most economical way. These pumps use the most efficient technology on the market to heat the water, it absorbs 80% of the heat in the air to heat a swimming pool: this means free heating! Its ability to extract air energy allows to obtain up to 5 times the energy it consumes, offering low consumption and making it more environmentally friendly, therefore low on energy consumption and highly eco-compatible. Developed specifically for private pools up to 80m³. 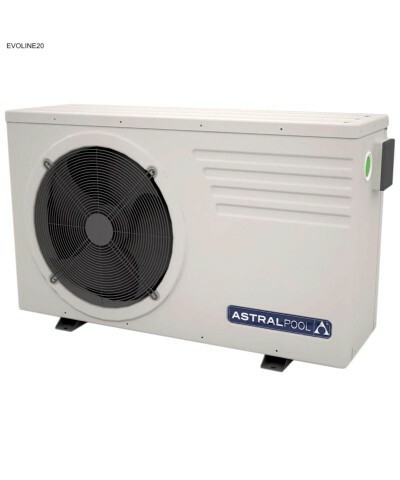 The heat pump with the best quality/price ratio on the market made for a connection to the general power supply with grounding. EVOLine has been specially designed to achieve huge energy savings in colder climates, significant energy savings for low temperatures. "C" energy classification. The higher the COP (performance coefficient), the greater the energy saving, so the lower the energy costs which lower the electric bills. 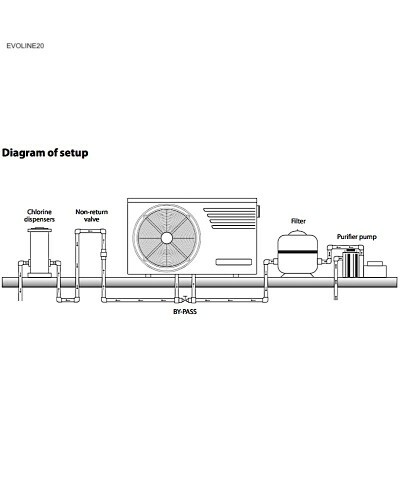 The EVOLine pumps have oversized components such as the evaporator and the Titanium A1 double-spiral heat exchanger. Electric resistance on the lower tray which prevents the formation of ice on the base of the unit, defrosting of the inversion cycle which allows a faster defrost. Fluidra Connect compatible, Modbus connection for connection with Fluidra Connect platform, free downloadable application for controlling the heat pump via Wi-Fi and 3G/4G. This heat pump is equipped with R410 A refrigerant free of ozone depleting agents, and has the minimum operating temperature of 0ºC. Digital control, high and low pressure switch, watertight electrical panel, heat and cold regulation to keep the temperature constant. ABS housing, which avoids corrosion, accessories included: winter cover, anti-vibration mounts, drain connection, waterproof housing, 10-meter screen connection cable, hydraulic connection fittings and Modbus signal cable. MAXIMUM OPERATING CONDITIONS - minimum outdoor air temperature 0° C, maximum pool water temperature 40° C, maximum water inlet pressure at 3 bar. The most economical way to lengthen the bathing season as it works at air temperatures below 0° C.
The best quality/price ratio on the market. Free downloadable app for remote control of the heat pump via Wi-Fi. With the free Astrine Astralpool app, check the temperature of the pool wherever you are. Maintains the temperature of the water in all weather conditions. Low noise level of 50dB (A) at a distance of 1 meter. Hot and cold thanks to the 4-way valve. Flow switch and high and low pressure switch. Heat and cold regulated to maintain a constant temperature. The heat pump is already connected to the general power in progress. Adapted according to the requirements and conditions of installation. The tolerance of variation of the threshold voltage is +/- 10% during operation. Protect the line with a circuit breaker and a 30mA residual current device. The appliance must bring the unit free of obstacles to the incoming air (30cm min) and to the outlet air (1.5m). It is not possible to trigger the projector with the torch from anything (1.5m). Cable section: this section is only a guideline and must be checked and adapted according to the needs and conditions of installation. Price €1,509.98 €1,509.98 Vat incl. €1,509.98 Vat excl. Pool volume (m³) approx. min/max: 17 - 24. Min water flow (M³/h): 2,7. Price €2,729.26 €2,729.26 Vat incl. €2,729.26 Vat excl. Pool volume (m³) approx. min/max: 35 - 66. Min water flow (M³/h): 6. Price €992.07 €992.07 Vat incl. €992.07 Vat excl. Pool volume (m³) approx. min/max: 5 - 12. Min water flow (M³/h): 1,3. Price €1,738.60 €1,738.60 Vat incl. €1,738.60 Vat excl. Pool volume (m³) approx. min/max: 19 - 30. Min water flow (M³/h): 3,6. Price €2,818.87 €2,818.87 Vat incl. €2,818.87 Vat excl. Price €1,352.64 €1,352.64 Vat incl. €1,352.64 Vat excl. Pool volume (m³) approx. min/max: 15 - 19. Min water flow (M³/h): 2,2. Price €4,726.81 €4,726.81 Vat incl. €4,726.81 Vat excl. Pool volume (m³) approx. min/max: 52 - 80. Min water flow (M³/h): 13. Price €1,869.84 €1,869.84 Vat incl. €1,869.84 Vat excl. 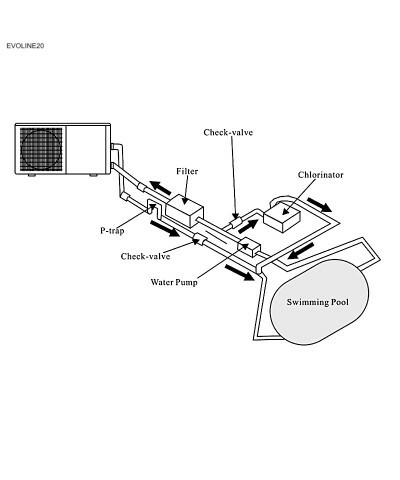 Pool volume (m³) approx. min/max: 20 - 35.